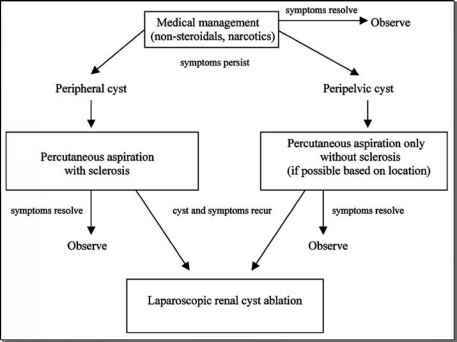 The indications for lymphocelectomy are based on the development of clinical symptoms as the majority of lymphoceles remain asymptomatic (13,14). Most lympho-celes tend to be small in size and remain clinically insignificant. In a longitudinal study by Spring et al. spontaneous resolution of the majority of lymphoceles after open pelvic lymph node dissection was observed. However, larger lymphoceles or those that persisted became clinically significant and required some form of intervention (3,9,15). Albeit rare, clinically significant lymphoceles develop in approximately 1.1% to 10% following pelvic lymph node dissection and 0.5% to 12% following renal transplantation and are one of the most important predisposing factors for incisional hernia in the transplant population (13,16,17). Clinically significant lymphoceles present in several different manners depending on their precipitating cause. The most common occurence is after a pelvic lymph node dissection, In these cases, patients will present with lower abdominal discomfort or swelling, fever, ipsilateral lower extremity swelling, deep venous thrombosis, scro-tal swelling, lymphocutaneous fistula, or incidentally on computed tomography for adjuvant radiotherapy to treat prostate cancer. Presentation following pelvic renal transplantation is similar, with the addition of perinephric fluid collections, renal failure, or suspected graft rejection. In the largest series to date, Hsu et al. performed a multicenter study evaluating current treatment strategies used for the treatment of lymphoceles. In the cohort evaluated, 96% of lymphoceles developed after renal transplantation and 4% after pelvic lymphadenectomy (13). Hence the majority of lymphoceles encountered will be in those patients who have undergone renal transplantation. Percutaneous needle aspiration has been described as an initial attempt to manage symptomatic lymphoceles. However, high recurrence rates are reported ranging from 42% to 100% (17-19). Moreover, attempts at percutaneous aspiration with concomitant instillation of sclerosing agents such as minocycline, tetracycline, ampicillin, alcohol, povidine-iodine, and fibrin sealants may cause an inflammatory reaction such that ureteral obstruction may occur, increasing the difficulty of dissection by either laparoscopic or open technique (13,20,21). Furthermore, the potential for contaminating a potentially sterile space exists as well. Like most procedures, experience of the surgeon is inversely proportional to complication rates. The clinically significant lymphoceles that follow pelvic lymphadenec-tomy will share a common wall with the parietal peritoneum. Access to those that are in close juxtaposition to the peritoneal cavity are relatively straightforward and require an opening and wide marsupialization of the overlying peritoneum for durable success. The most frequent location of posttransplantation lymphoceles was superomedial or inferomedial to the renal graft (19). Small lymphoceles (<100 mL) lying near the renal hilum, or lateroposterior, lateroinferior, or inferomedial lymphoceles are the most difficult to drain laparoscopically. If laparoscopic experience is limited, other modalities for drainage should be employed (13,14,19). Intervention is indicated for symptomatic lymphoceles or those causing graft dysfunction. Conservative management, including percutaneous drainage or sclerother-apy, may be considered for small lymphoceles or those causing minor symptoms. However, for larger lymphoceles, or those causing serious complications such as renal insufficiency, surgical therapy is required. Laparoscopic techniques may be used in these patients or in patients with recurrent lymphoceles after conservative therapy had failed. Laparoscopic drainage is contraindicated if the lymphocele is infected. These patients should undergo open surgical drainage with concomitant administration of intravenous antibiotics.